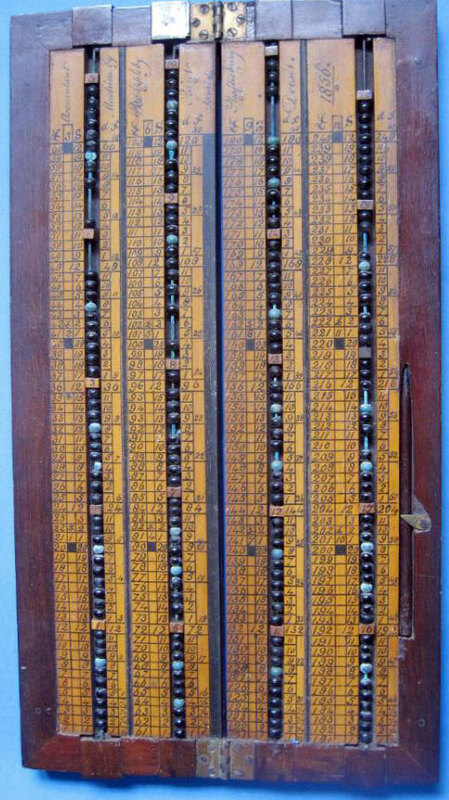 In 1850s James R. C. Appleby, a linsey maker and hosier from Shaftesbury, Dorset, England, devised a stylus managed calculating device (kind of a simple money abacus), a model of which managed to survive to our time (see the lower images). The device is labeled: "Accountant Machine by RC Appleby, Saint James, Shaftsbury, Dorset, 1856". A stylus is present in a fitted compartment. James Ramsey Cuthbert Appleby was born on 2 Jan. 1807 in Shaftesbury, Dorset, a child of George (1767-1841) and Elizabeth Appleby. He spent all his life in Shaftesbury, working as a linsey maker and hosier, and later as a parish clerk. James Appleby died in 1891 in Shaftesbury.